Our feet go through an enormous amount of wear and tear just from walking. It’s no wonder why we demand the best foot cream for calluses! Add to that any sort of athletic or recreational activity and you’ve got yourself some worn out feet. The teams in the Southern Feet Division are put together specifically to combat in this venue (feet). Do You Want the Best Foot Cream for Calluses? One of the best ways to treat dry and callused feet is to take one of these teams product and apply it to your feet. Now there are many different brands and types of foot cream of the market, but if you are looking for the best, search no further! The teams in this division are the top five foot creams to be found anywhere. They are head and shoulders (knees and toes) above the rest. As the “cream” (pun intended) of the crop, they will compete for the title of Best Foot Cream for Calluses in this division (and therefore the best to be found). May the best cream win! The teams below make up the Southern Feet Division. This division will tickle your toes when you watch their games. But, don’t think these teams view the competition as a barrel of laughs. They plan to plant their opponents feet up. One of these will end up being the best foot cream for calluses. See if you can figure out which one has the talent to win it all in the Lotion Challenge! The Gold Bond owner has created a very reliable brand for foot products, especially foot moisturizers. 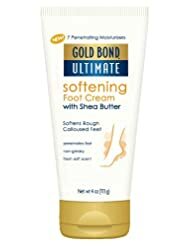 Gold Bond Ultimate Softening Foot Cream with Shea Butter promises that it is has the talent to specifically compete in callus (will this be the best foot cream for calluses? ), dry, rough, and cracked heel venues. This team is packed with talent. The star of this team is HYDRALAST. This star is in great shape which allows it to last up to 24 hours (all the while retaining moisture). How many games last that long? This player has many talents like emollients and humectants that are fantastic in crunch time for softening skin. This is the talent you want on your team when your are facing that touch division foe in a critical game. The talent for this team doesn’t stop there. This GM for this team has surrounded its star player with several role players that provide exactly what you need when you need it. There was only one real complaint written for this product. But, I don’t believe them. They claim to have used this product “for 1 year daily”, and supposedly found “no signs of improvement”. I find it hard to believe anyone would keep using any product for a year if it wasn’t providing any sort of benefit. This team’s fan base is STRONG. The percentage and sheer number of positive reviews is impressive. I will be giving this team a whirl myself! Neutrogena is another well-known brand of moisturizer, both for hands and for feet. This teams fan based is one of the strongest in the entire Lotion Challenge league. 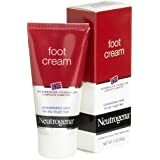 Neutrogena Norwegian Formula Foot Cream contains keratin amino acids as well as menthol; two ingredients that moisturize and rejuvenate feet. The keratin amino acids increase skin elasticity and hydration, while the menthol stimulates the muscles of the foot and brings the skin back to life. The very few complaints of this product surround the strong smell and the cost. So, if you have a sensitive nose, you might want to get behind a different team in this division. However, the number of very positive reviews on this product suggest that it not only can this team compete in the Southern Foot Division. This team may just dominate for the title of best foot cream for calluses. The folks at Purely Northwest have constructed this unique entry into the Southern Feet Division. Even though most teams in this division are creams, this team takes a different slant at solving the same issue. 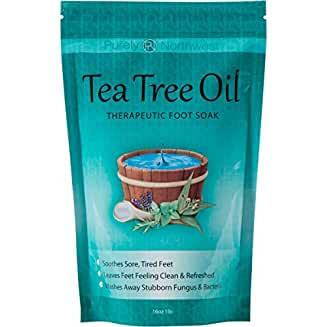 Tea Tree Oil Foot Soak With Epsom Salt is a foot soaker of a team. They immerse you into their way of doing things and come at you from all angles. Tea Tree Oil was able to become a late entry into the Lotion Challenge league due to team violations by the Podiatrist’s Secret team. This team is a #1 rated team in this division with a strong backing of fans. It also is a very talented team that not only softens your callused heals, it eliminates bacteria and fungus. 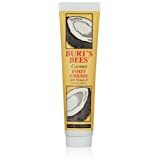 Another very well-known brand for lotions, lip balm, and more, Burt’s Bees is the promising creator of a wonderful coconut flavored foot cream. Burt’s Bees Coconut Foot Crème includes coconut oil and a hint of peppermint. The coconut oil targets the skin, leaving it looking younger and rejuvenated. The hint of peppermint nourishes the skin and boosts the texture of smooth skin. The few negative reviews of this product involve complaints about the color and consistency of the cream itself. They complain that the cream is too thick and that the color is brown instead of a “crème” color. These complaints can be easily resolved when considering that the flavor of the crème is coconut, resulting in a light brown color, and that it is a cream, not so much a watery substance. All in all, I trust Burt’s Bees and I think it would be a delight to purchase this wonderful product. It is a strong contender for the title of best foot cream for calluses. One of the more well-known foot lubricant brands out there is O’Keeffe’s. They are known for their high quality and extremely moisturizing products. 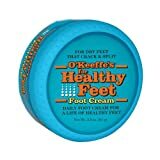 O’Keeffe’s Healthy Feet Cream, geared toward lubricating well-worn feet, includes water and glycerin. Water is responsible for hydrating the applied surface, and glycerin locks in the moisture obtained by the water. This product seems to work best after a good soaking of your feet in Epsom salt, which will loosen up the skin on your feet. A small percentage of the reviews for this product complained of the consistency of the cream, but only because it wasn’t as thick as they anticipated. Overall, this is a wonderful product for dry and cracking feet. Once you’ve treated the skin on your feet to one of these fabulous creams, you can top it off by going to get a pedicure. With a good pedicure, your feet will be ready for all types of open toed shoes. And, now that the skin on your feet is soft and supple and no longer ugly and cracked, you won’t feel the need to hide them. A pedicure can be the whipping cream on top. So, be proud of your feet now that you have them in tip top shape. Show them off! Be creative! Let loose! Look at the toes in this photo. They look spectacular. You just might be the center of conversation at the party with a great pedicure like this! You’ll want to include the best foot cream for calluses in your foot pampering regime so you can be confident while showing off your new nails. Overall, there are a whole slew of different options when it comes to hydrating and moisturizing your worn out feet. Here I’ve listed the best and highly rated brands and products. Feel free to go crazy with the suggestions listed here and don’t feel worried about the quality of these products. They are the very best. All of the products listed here ranked at a 4.4 out of 5 or higher. We truly feel any of these product could be considered the Best Foot Cream for Calluses on the market!